Baptism has been a part of the Christian Church since John the Baptist came to forerun the first coming of our Lord Jesus Christ. John was baptizing in the River Jordan for repentance (Matthew 3) and his Message was to prepare the hearts of the people to receive Jesus Christ as Lord (Isaiah 40:3). Jesus Himself was baptized by John (Matthew 3:13-15) and He is our example. 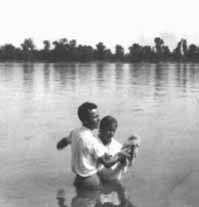 Many who confess Jesus Christ today as Saviour and Lord have been baptized in their churches in the titles of Father, Son and Holy Spirit, on the authority of the Word of God (Matthew 28:19): "Go ye therefore, and teach all nations baptizing them in the name of the Father, and of the Son, and of the Holy Spirit." These same persons, who acknowledge every Word of God to be true, deny or put aside Acts 2:38 : "Then Peter said unto them, Repent, and be baptized every one of you in the name of Jesus Christ for the remission of sins, and ye shall receive the gift of the Holy Spirit", because the teaching of their church, not having the revelation of Acts 2:38, considers the words of Peter as secondary to that of our Lord. Jesus Himself said in Matthew 4:4, "Man shall not live by bread alone, but by every word that proceedeth out of the mouth of God". Therefore the question arises are the words spoken by Peter in Acts 2:38 contrary to what Jesus said in Matthew 28:19? God's Word is not contrary within itself, yet according to men's understanding it would appear that the infallible Word of God has two opposing statements. Please consider these thoughts. There must be an answer because the Word of God is Truth (John 17:17) and this truth must be a revelation to you personally if you are to know the Lord Jesus Christ and be known of Him. His coming for His Church is very near. The reason sincere people are misled and in some cases confused, is that the theology of the organised churches has replaced the revelation of God's Word by the Holy Spirit. What is the NAME of the Father and of the Son and of the Holy Spirit? Many who will be reading this page have been baptized in a denominational church, by sprinkling or immersion according to Matthew 28:19, and yet they do not know that NAME. Others will be considering baptism in water and you should know that NAME before you are baptized. Father is not a name; Son is not a name; Holy Spirit is not a name. Would it not be strange to sign a cheque on your bank account with the word father, son, or grandfather? You know that such a cheque would have no authority; the why be baptized in the titles of Father, Son and Holy Spirit? You may say, "Jesus said to be baptized this way and that's good enough for me." It is true Jesus gave that commandment, and in verse 20 of Matthew 28 confirmed that if this commandment was taught and observed He would be with us always. Was it not the same Jesus who met Paul on the road to Damascus as the Pillar of Fire, or as the Holy Spirit filled the upper room on the day of Pentecost? (Acts 2: 1-4) Jesus also said in John 14: 16-18, "And I will pray the Father, and He shall give you another Comforter, that He may abide with you ever; Even the Spirit of truth; whom the world cannot receive, because it seeth Him not, neither knoweth Him: but ye know Him; for He dwelleth with you, and shall be in you. I will not leave you comfortless: I will come to you." It was our Lord Jesus Christ, who had risen from the dead after being crucified, who spoke through Peter in Acts 2: 14-36, and the words spoken brought conviction on the hearers who had crucified Jesus, causing them to cry out, "Men and brethern, what shall we do?" (Acts 2: 37) Then in verse 38, the Lord Jesus, still speaking through Peter, said: "Repent, and be baptized every one of you in the name of Jesus Christ for the remission of sins, and ye shall receive the gift fo the Holy Spirit". The name of the Father and of the Son and of the Holy Spirit is the Lord Jesus Christ. Not by sprinkling but by immersion as Jesus was baptized, by one who has been filled with the Holy Spirit, having this revelation. If you have been baptized in the titles, then youshould be rebaptized in the name of the Lord Jesus Christ. Every Christian must be baptized according to Acts 2: 38; it is God's provided way to receive the gift of the Holy Spirit. Colossians 3: 17 says, "Whatsoever ye do in word or deed, do all in the name of the Lord Jesus, giving thanks to God and the Father by Him". Surely baptism is a word of confession and deed. There is no reference in the Word of God to a trinity of persons being God. Trinity doctrine is contrary to Scripture and is error. John 4: 24, "God is a Spirit: and they that worship Him must worship Him in spirit and in truth". In Mark 12: 29, " Hear, O Israel; the Lord our God is one Lord". Also Ephesians 4: 5-6, "One Lord, one faith, one baptism, One God and Father of all, who is above all, and through all, and in you all". The trinity doctrine and baptism in the titles of Father, Son and Holy Spirit, which is the basis of the first denominational church and other organised chruches, came to be accepted as church doctrine about 325 A.D. at the Nicea Council, and it is suggested you confirm this in the records of this Council meeting at your library. The Revelation of the Lord Jesus Christ is the rock upon which the Church, being the Body of Christ, is built (Matthew 16: 16-18). However, by the reasoning of men, the doctrine of a trinity of persons and baptism in the titles substituted for the Revelation of the Lord Jesus Christ and originated the denominational system as it is to this day. God is a Spirit who came to redeem or reconcile to Himself those who were lost, by coming in the body of flesh and blood of His Son (Hebrews 10:5). The Son, as the body, was born of a virgin, as it was necessary to by - pass the original sin in the Garden of Eden, and she was overshadowed by the Holy SPirit (Luke 1:35). Did Jesus the Son have two fathers? The trinity and oneness doctrine are both in error. The Word of God reveals the revelation of the Lord Jesus Christ, and every Christian must confess that Jesus is the Son of God (1 John 4:15). Jesus the Son was the body of tabernacle of flesh and blood in which the Father, a Spirit, dwelt or was revealed. This does not make Jesus the Son a second part of a trinity of persons, but a manifestation of God (John 1:1 and 14). The body of flesh and blood was our sacrifice that through this blood we may boldly come into His Presence (Hebrews 10:19), and know Him, and be in Him. 1 John 5:20, "And we know that the Son of God is come, and Him that is true, and we are in Him that is true, even in His Son Jesus Christ. This is the true God, and eternal life." The Bible says clearly that God was made flesh and dwelt among us, and Jesus the Son said in John 14:7, speaking to His disciples, "If ye had known Me, ye should have known My Father also: and from henceforth ye know Him, and have seen Him." John 14:16-20 confirms the same truth when Jesus was speaking about the Comforter, which was the manifestation of God to and in the believers, after the body of flesh and blood of the Son had passed through Calvary to redeem us. The Comforter at that time had not come, but Jesus said they knew Him! Why? Because Jesus was the Holy Spirit; the Comforter revealed in flesh and blood: but after Calvary He would come to them and be in them. May the Lord God Almighty reveal to you the Revelation of Himself and His name, the Lord Jesus Christ. John 17:3 says, "And this is life eternal, that they might know Thee the only true God, and Jesus Christ, Whom Thou has sent." Jesus further said in Matthew 24:44, "Therefore be ye also ready: for in such and hour as ye think not the Son of man cometh", and if you have not been baptized in Christian baptism according to the Word of God and you desire to be ready for the coming of the Lord Jesus Christ, may you prayerfully wait upon the Lord and be baptized according to Acts 2:38.